Few musicians have the opportunity to pay homage to their musical idol, much less send them a recording and receive a reply. CLAUDIO PARODI did just this, sending “Horizontal Mover” to Alvin Lucier. The response was nothing short of overwhelming – “I find it absolutely beautiful”. This shows the humility of Lucier, a pioneering artist, and the talent of PARODI in producing “Horizontal Mover”, a work that deserves such praise. PARODI followed his own interpretation of the classic “I am sitting in a Room” using cymbals, drums and toms to invent his own vision of diffusion, resonance and the recording process. Such a process treads a tightrope between concept and music. Fortunately PARODI’s sensibilities are firmly planted in bringing forth music that is both satisfying and challenging to the listener. The sounds keep building on themselves, layer upon layer, to create an intriguing textural music that rewards repeated listening. “Horizontal Mover” (homage to Alvin Lucier) is the first of seven generative compositions that PARODI is recording for Extreme. Other musical luminaries to be showcased in the series include Charles Hayward, Yasunao Tone (of Fluxus) and Alvin Curran. Horizontal Mover is the first chapter of an ongoing series of seven works. Each of them will freely utilize as a generative source one of the seven tracks of the CD “Suoni 2005” by Tiziano Milani. The writing on the cover of the CD “Qualsiasi tipologia di manipolazione ? concessa” (any kind of manipulation is allowed) and my friendship and mutual respect with Milani allows me to do that. There is no schedule for the series, only time will tell in which order and when it will be completed. Horizontal Mover utilizes track 1 (4’16”) of Milani’s CD. As stated, Horizontal Mover pays homage to the work of Alvin Lucier. The main point of reference is the gorgeous masterpiece “I am sitting in a room”. The work by Alvin Lucier is based on the diffusion and recording of the previous recorded spoken phrase, each recording emphasizing the natural resonance of the room, until the loss of the speech. I used the same principle, with some differences. First of all, the original track was omitted. For each of the twelve diffusions to be recorded, the model and position of the diffusers was changed, along with adding resonators (each time different and in a different position) and humming amplifiers. The use of resonators is another feature of Alvin Lucier’s work. After every recorded diffusion, determinate seconds of music were cut and – starting from part ten – duplicated (differently on the left and right channels). Before the next diffusion and recording, the material was stretched exponentially. Every stretch uncovered new detail in Tiziano Milani’s accumulative work, with each element remaining mysterious. For every recording, only the diffusion of the first part of the previous stretching was used. At the stretching of part number seven, the computer failed, due to the dimensions of the file, and from that point on only portions of the file could be stretched. That led back to the pioneers’ age of electro-acoustic music, when machines were asked to do too much. Due to the time for every stretch, the first day of recording ended at part number nine. The morning after was a surprise! Omitted on the score was the direction of resonator number nine for part ten, and I decided to put it toward the direction of the microphones. With the new day the last three parts were energized by the sun and due to the position of the hummers we had to twice increase the volume of the diffusers, until the truncated last diffusion, which left on the recording the natural reverberation of the room. The week after, the twelve parts were cross-faded to create a continuum and the work was done. Hummers: Yamaha preamplifier + Peavey TKO 80, Fender Super 60. 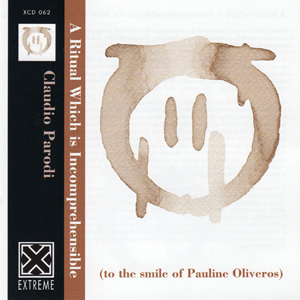 Composed (November 26th, 2005) and performed (December 9th & 10th, 2005) by Claudio Parodi. using two microphones (OKTAVA MK 012) direct to hard disk. Mastered by Claudio Parodi and Paolo Valenti at Loud Music Studio.